A visitor shortly before me to Reuben Kadish’s impressive exhibition at the Staller Center in Stony Brook asked it the sculptures “had been dug up from the earth” This seems a wonderfully apt question to pose. 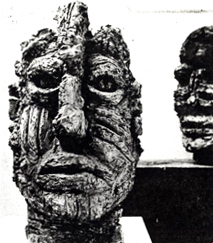 Of course they haven’t been dug up — they are the result of Kadish’s long and fruitful career which began in the ’30s — and yet there is something elemental and ancient seeming about these rough-hewn and monumental pieces. The sculptures are all either of terra-cotta, which roughly translates from Italian as cooked earth — the wry substance that Genesis tells us Adam was formed from — or of bronze, one of the first metals to be used by people. Yet at the same time. Radish is very 20th Century in his eclecticism. For it is only in this century that the art of primitive civilizations has been appreciated for its esthetic qualities rather than its curiosity appeal. Without compromising his individual vision and identity. Kadish has paid homage to the sculptural traditions and mythology of such disparate civilizations as the Aztec Empire, Egypt, the Kingdom of Benin, and ancient Greece and India. This melding of influences only underscores the common links among cultures. The bronzes and terra-cottas from the 1960s, such as the “Three Sisters” series and the “Earth Mother,” present the female form as an icon of fertility; here Kadish delights in the full breasts, rounded stomachs and thighs of the archetypal woman. In two interesting recumbent pieces, the “Pregnant Aphrodite with the Turtle” and “Medusa,” both in terra-cotta, Kadish harks back to both the beautiful and the evil aspects of woman from Greek mythology. The striking series of very much over life-size heads bring to mind the enigmatic figures on Easter Island the huge monolithic, disembodied faces looking out to sea. Rut here Kadish demonstrates, how it is possible to create strange and powerful sculptures based on many different traditions. Two strung but ungainly “Golems” are representations of the Jewish story of men of clay that come to life, created like Frankenstein’s monster by humans. Two “Budghayas” have the stylized eyes of Ancient Indian sculptures. In addition to the sculptures, the exhibition includes black-and-white drawings and monotypes from various periods in Kadish’s career. I liked the stylish simplicity of the undated “Rat” in which the animal’s tail curves round to make an almost perfect circle. Twenty drawings from 1960-89 are variations on themes of sexuality, mythic beasts, including; hydra with skull heads, and the human form, and are energetically exuberant. In contrast with the large scale of most of the pieces in the show, the “Shelf of 25 Studio Studies” in bronze and clay do indeed look like figurines unearthed from the tomb of some ancient civilization and are marvelously inventive and diverse. The show, curated by painter Mel Pekarsky, demonstrates the ability of the sculptor to transcend the particular to create timeless artifacts of enduring power.